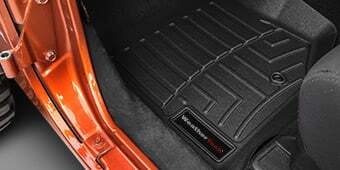 Please select options for Rugged Ridge 2 in. Receiver Hitch Kit w/ Wiring Harness & Jeep Logo Hitch Plug (07-18 Jeep Wrangler JK) at the top of this page. Specs. This Receiver Hitch with Plug from Rugged Ridge is custom designed and bolts right to factory mount points on the back of the vehicle. Simliar to the OE hitch, this features a standard 2 inch square receiver. It has a tow rating of 3,500 lbs for 4-door Wranglers and 2,000 lbs for 2-door Wranglers with 2 inch openings. You will need to consult your owner's manual for details. A wire harness is included, and it's made to the original equipment specifications. 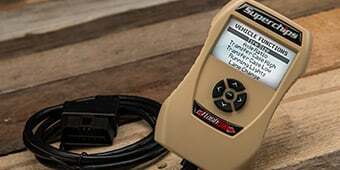 It plugs right into the existing wiring harness, which prevents you from needing to make frustrating and expensive modifications to your Jeep's wiring. Construction. This piece is designed with a durable power coat, which sheds water and ensures a long-lasting finish that's rust and corrosion free. It's manufactured as a 1-piece welded assembly for additional strength, and was built specifically to match the towing capacity of your Jeep. Application. This 2 inch receiver hitch with plug fits 2007-2018 JK Wranglers. This will work with the bumper on the Backcountry edition. This will be the same bumper that was used on the Modern Warfare III edition. Yes, as long as the bumper is ready to accept a tow hitch, it will fit with the with the Freedom Steel bumper. This is able to work the the 75th anniversary bumper. I bought the Gibson Metal Mulisha exhaust from you guys about two years ago. I had to take off the tow hitch I had on there previously cause it was to long and touched the muffler. Can you tell me if this hitch will fit on my Jeep with this exhaust? It’s a 2017 Wrangler Chief Edition. We have not tested the Rugged Ridge 2 in. Receiver Hitch Kit with the Gibson Metal Mulisha exhaust, however we do not believe this may fit. What is the maximum tongue weight of this? This hitch has a maximum tongue weight of 350 lbs. Unfortunately, this kit was not designed to work with the JL wrangler and will not fit properly due to the slight differences between the JK and JL models as well as the difference in wiring. 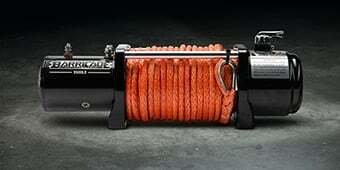 Rugged Ridge designed this hitch and wiring to be a an easy installation on with the JK Wranglers. 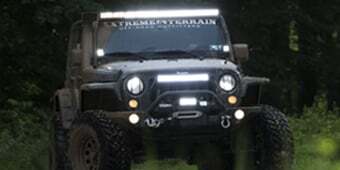 We do have a hitch that is designed to fit properly with the JL wranglers that you can find here: https://www.extremeterrain.com/mopar-2-receiver-kit-2018-jl.html. The Rugged Ridge 2 in. Receiver Hitch Kit w/ Wiring Harness & Jeep Logo Hitch Plug is only intended for 2007-18 model JK wranglers, not the new JL models. 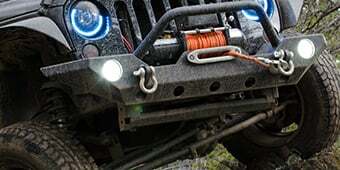 The hitch we offer for the JL can be found here: https://www.extremeterrain.com/mopar-2-receiver-kit-2018-jl.html. This hitch will fit the stock 2016 Backcountry edition steel bumper and some aftermarket rear bumpers with an OE style hitch cutout. 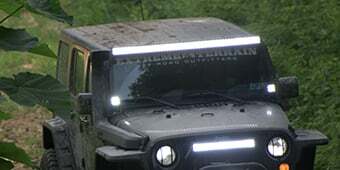 Yes, the Rugged Ridge 2 in. Receiver Hitch Kit w/ Wiring Harness & Jeep Logo Hitch Plug is made very similar to the OE hitch and will be compatible with your Back country edition bumpers. The Rugged Ridge 2 in. Receiver Hitch Kit is not made in the USA, but is made in China. Yes, as long as the bumper is ready to accept a tow hitch, which the Rubicon bumper is, you will be able to install this hitch. Hello, If your bumper has a notch cut to accommodate a hitch then this should work. If you wanted to send us a picture of your bumper to our support email support@extremeterrain.com we can give you a better idea of whether this hitch kit would work with your set up. Hello, as long as the bumper is ready to accept a tow hitch, which the Hard Rock bumper is, you will be able to install this hitch. Overall good product. The lock alignment is poor. You have to lift up the lid to turn the lock. Not a crisis, but you would think an easy fix. Easy to add and hookup! It was an easy addition to the stock bumper to allow me to add a trailer hitch, bike carrier or storage rack! Everything is great quality, great prices and shipped fast! Easy install of hitch and wiring. Bumper cover removal and install took as long. Everything fit fine and the wiring harness made everything go easy as possible. This is a well made hitch. The wiring harness is plug and play. I am really happy with the quality of the materials. The biggest issue I had with the installation was getting the nuts onto the bolts in the tight space of the JK. I realize this is not a problem with the product but it is an opportunity for them to make an improvement by welding the bolts in place on the back flange. It sure would help! Overall easy install. Fits perfectly. Needed for a bike rack and trailer pulling capabilities. I am very pleased with the hitch. Easy to install and wiring harness was easy to install too. Works well. I needed you tube to install it but no big deal. It fit perfectly, went on easily-no hiccups. Husband loves it, nice to know it's there when we need one. This fit just as stated. Installation was easy. Electrical harness was simple, just plug and go! Exactly what I ordered. Easy to assemble and installed on my 2017 Wrangler in the driveway within 30 minutes. Hitch was very easy to install, less than an hour. Fit perfect on 2 door Wrangler Willys.